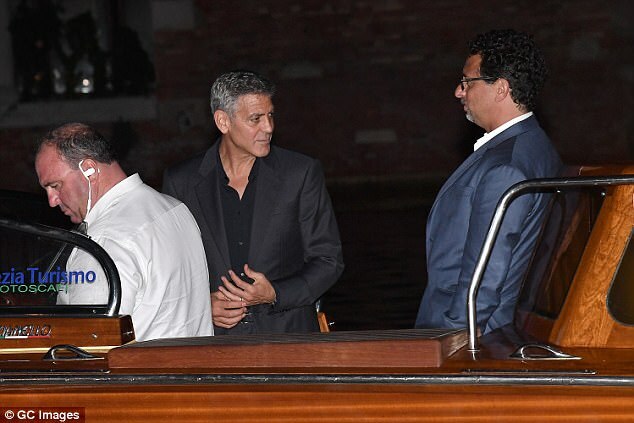 George Clooney’s introduction to the 74th annual Venice Film Festival proved to be surprisingly low-key as stepped out with glamorous wife Amal on Thursday evening. 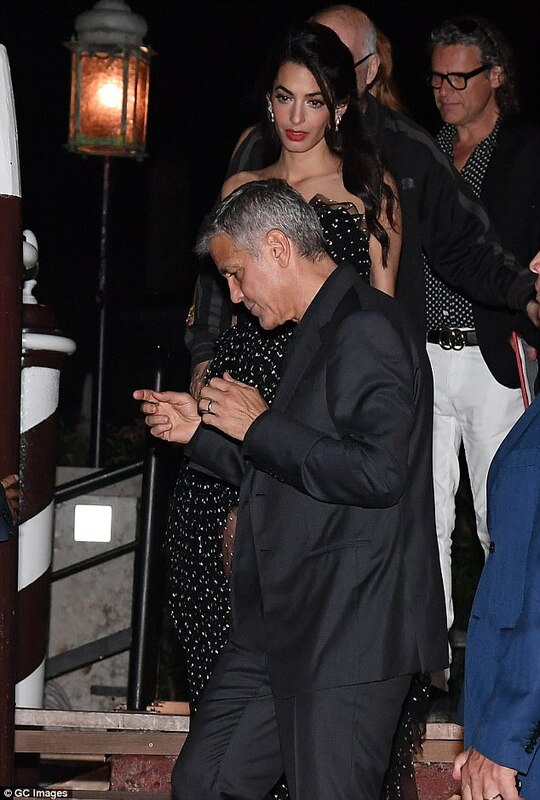 The couple were making their first appearance in the picturesque Italian city following the birth of twins Ella and Alexander in June, and they were elegantly dressed as they exited the upmarket Hotel Cipriani ahead of a night out. 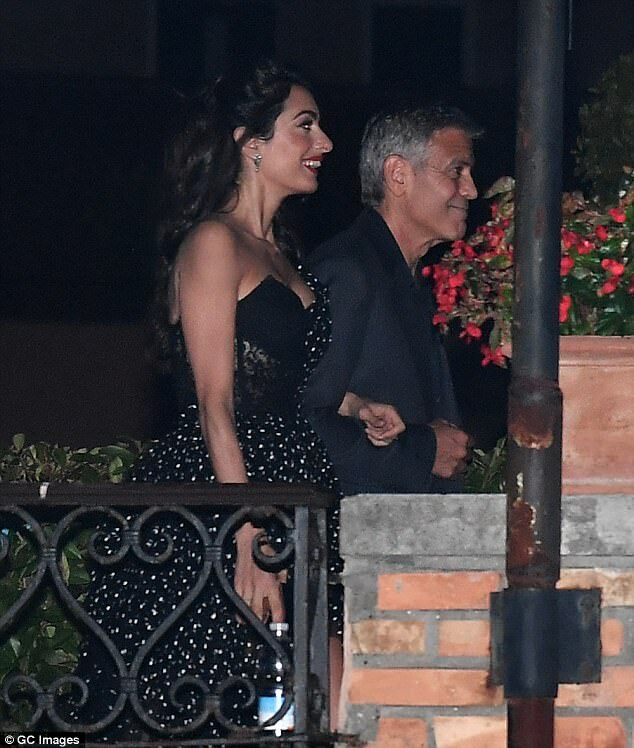 Sporting a sophisticated off-the-shoulder evening dress with spotted embellishments, Amal, 39, continued to show off her impressive post-baby physique while making her way towards a waiting boat. The human rights lawyer added to her look with a pair of conventional black stiletto heels, while vivid red lipstick gave an otherwise subdued wardrobe an added splash of colour. 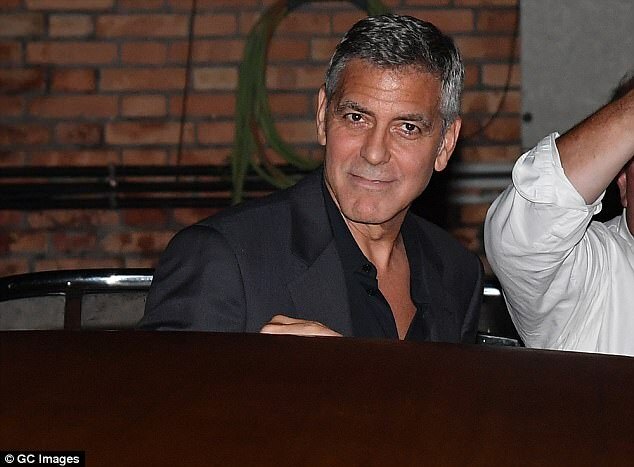 Joining his wife, George, 56, looked appropriately dapper in a grey two-piece suit and matching open neck shirt as they prepared for their romantic evening. 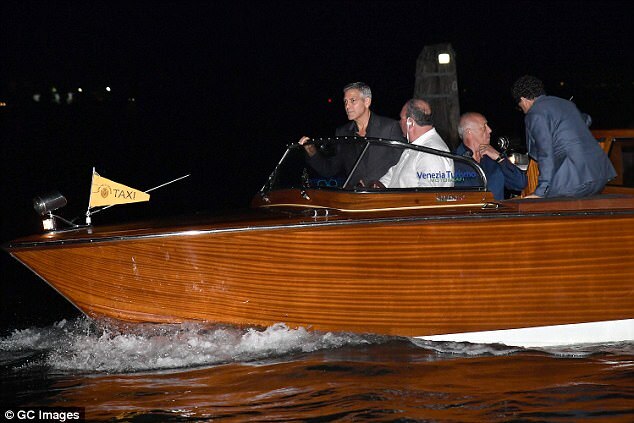 Venturing onto the small boat that waited to whisk them across one of the city’s winding waterways, George gallantly helped Amal, who gingerly followed behind her husband. The Berkshire based couple have enjoyed a life-changing two months following the birth of their children, with George recently admitting he never dreamed he'd be looking after two infants at his age. 'Right now my job is changing diapers and walking them around a little bit. I really didn't think at 56 that I would be the parent of twins. 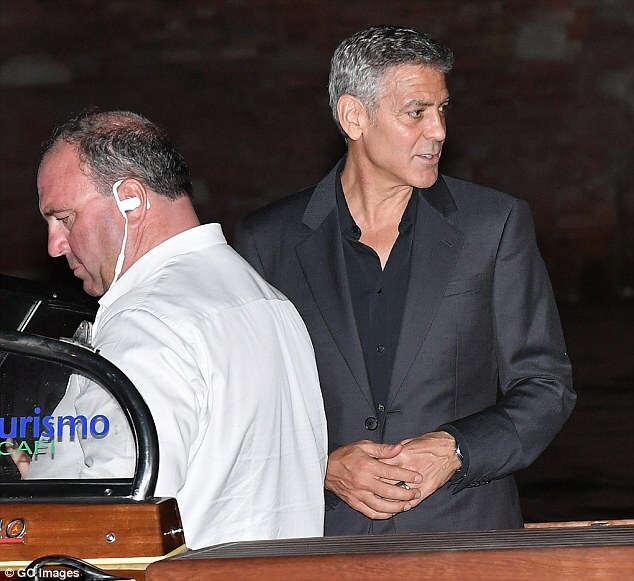 Clooney is currently preparing for the October premiere of his new thriller Suburbicon which he is directing, which stars Julianne Moore, Matt Damon and Oscar Isaac. 'It's a pretty angry film. There's a lot of anger out there. I think that's reflected in the film. I found it interesting to talk about building walls and scapegoating minorities. 'I think that's always an interesting topic but particularly when I was hearing these conversations on the campaign trail. New parents: The Berkshire based couple have enjoyed a life-changing two months following the birth of their children, with George recently admitting he never dreamed he'd be looking after two infants at his age. George is looking handsome as usual. They all look really tanned and rested. 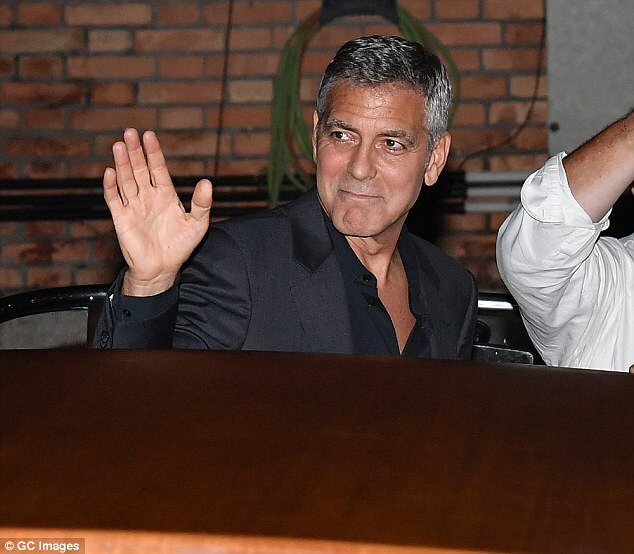 George looks good, but maybe a little thin? Grant looks great. Surprised he was alone. Even Gio looks terrific! 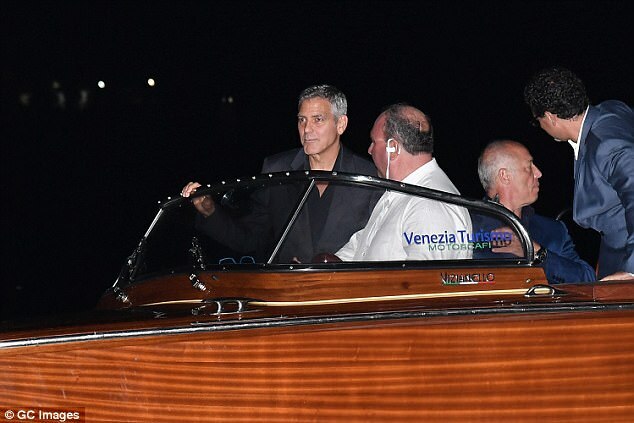 And isn't the guy in the white shirt the same man Letterman pointed out in one of the vaporetto pictures from the wedding weekend, when George did his show? The one he called Guido and George said "Close"? George and Amal look great. And so does Grant. I'm assuming Lysa was there too tho the DF didn't catch more than her hair. 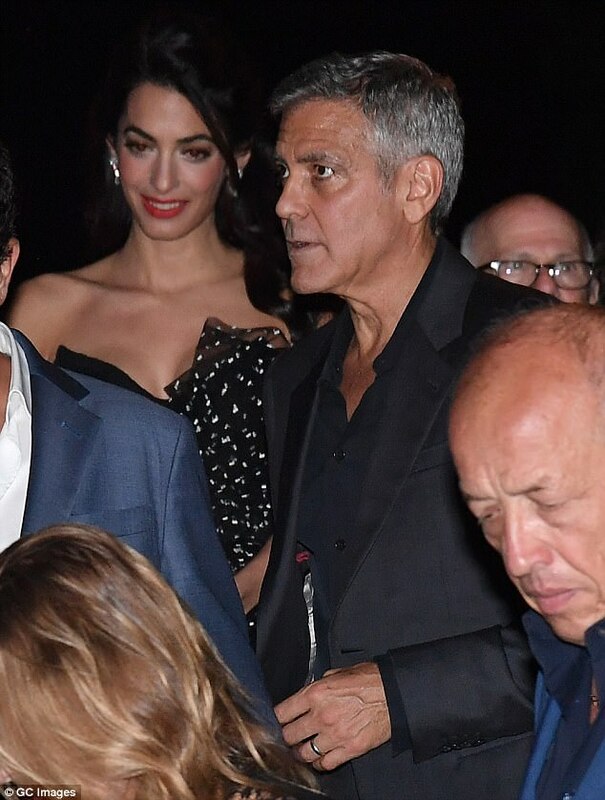 We need PAN to ID the guy in the white and black dotted shirt ... was he coordinating his look with Amal? I can't place him. Nice to see Stan too. There was a blonde woman behind them in the pictures that may have been Lysa. annemarie wrote: There was a blonde woman behind them in the pictures that may have been Lysa.